I simply live for dishes like this! 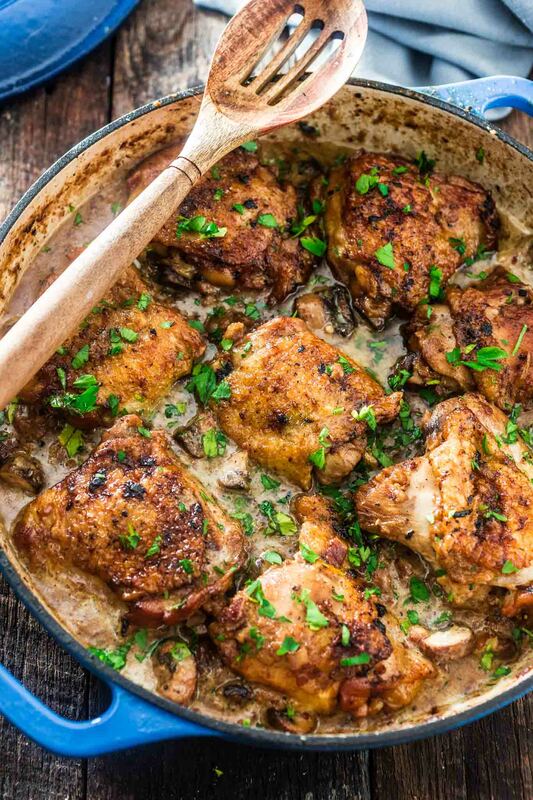 Hearty, comforting chicken or beef that cooks for a long time and taste like… love. Yes, that’s the thought I was looking for. This Coq au Riesling tastes like love! Yesterday, when Tim got home from work, he told me he could smell something delicious from the hallway. He said he knew something special was going on and that made me feel all warm and fuzzy inside. That feeling, however, only lasted until I saw his puppy eyes when I told him he couldn’t eat the chicken because I still had to take pictures. Oh, the hard life of a food blogger’s husband! ??? I can’t blame him though. The apartment did smell like you wouldn’t believe it! And the wait was totally worth it, because the Coq au Riesling was PHENOMENAL. Definitely the best thing we’ve eaten in recent times! I wish I could say special dishes like this Coq au Riesling happen on a daily basis in our home, but the truth is that more often than I’d like to admit, my husband gets home to a huge mess, with an overworked wife, running around like a mad woman, trying to finish her to-do list (which never happens, by the way!). I am far from complaining, because I am lucky to work doing what I love and I’m the happiest I’ve ever been. But the fact that I’m so busy does mean that we have to live off easy, 15 minute meals, while elaborate dishes like this one, only happen sporadically. It doesn’t have to be a special celebration, like birthdays or holidays, although this dish would certainly impress guests on any of those occasions. It is usually for Sunday supper or even for dinner on a day where I managed to get things done and have an hour to spare, like yesterday. The good news is that even though this Coq au Riesling will take at least 1 and a half hours to be on the table, you’ll only have one pot to wash at the end! 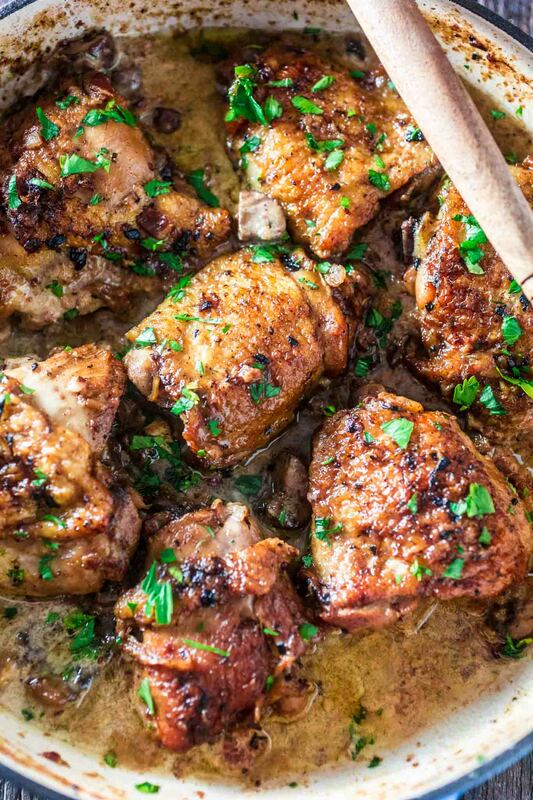 Also, apart from some browning and sautéing, most of the work is hands-off, meaning that while the chicken is braising, you get to read a book, watch your favorite Netflix show or sip what’s left of the Riesling you used on the dish. Or maybe even open a new bottle! ? And speaking of Riesling, make sure you use a good quality dry or off-dry variety for this recipe. 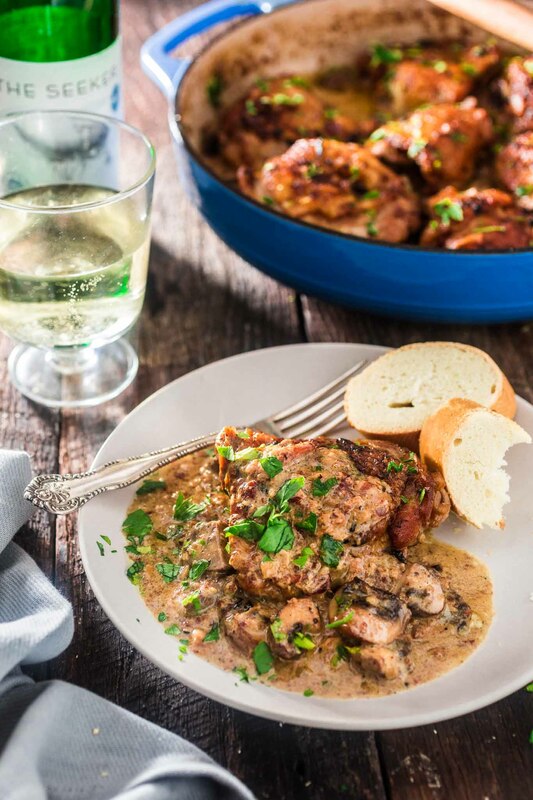 A good rule of thumb is to always cook with a wine you would drink! One of my favorites is The Seeker Riesling, from Mosel in Germany an off-dry Riesling with crisp acidity and vibrant fruit flavors that really enhance this dish. 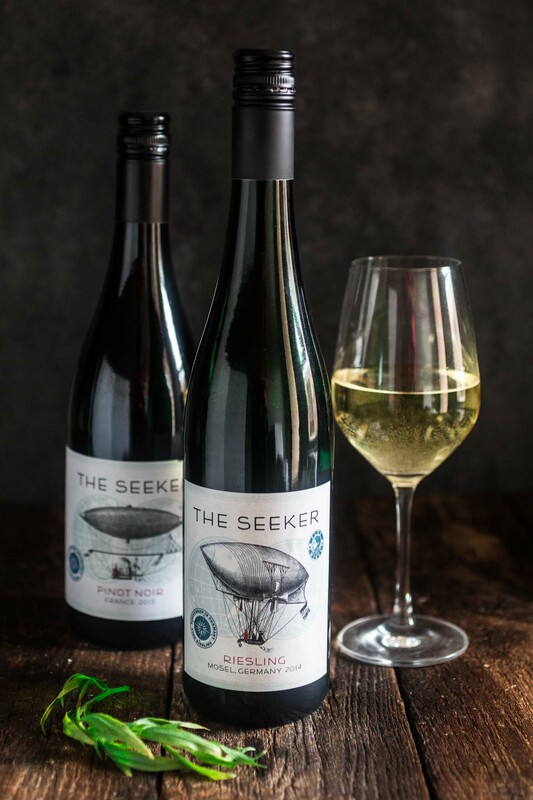 I’ve been of fan of The Seeker Wines ever since I laid eyes on their fun labels featuring mid-19th century flying machines that embody an era of wonder and mystery, of explorers out to conquer the known world and beyond. It totally fits the mission of this very blog, who aims to take you on a journey through flavors from around the world. After all, who doesn’t love the idea of being taken on a journey by trying new wine varieties and delicious dishes, and feeling the trill of adventure and discovery with each sip or bite? 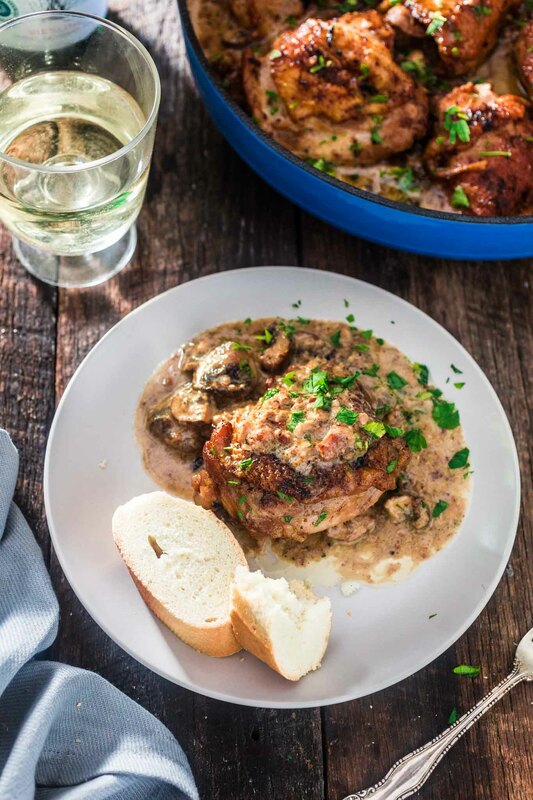 If you can relate, I am 100% sure you will LOVE this dish as it takes your tastebuds straight to France (the Alsace region, to be more specific!) . This Coq au Riesling was not only a huge hit in our home, but it was possibly one of the best things I have ever cooked. Serve it with rice, buttered noodles, potatoes or just with some crusty bread, and you have a perfect comforting meal to serve to your loved ones! 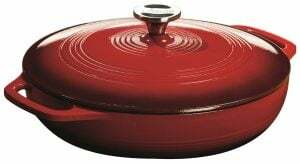 Place a large flameproof casserole or dutch oven on the stove, over medium heat. Add the bacon strips and cook, stirring frequently, until they begin to brown (but not crispy) and most of the fat has rendered, about 5 minutes. Then, add the shallots and cook until soft, about 2 minutes. Add the minced garlic and cook until fragrant, about 1 minute. Transfer the bacon and sautéd shallots/garlic to a bowl using a slotted spoon, leaving the fat behind. Generously season the chicken thighs with salt and pepper. Add the chicken to the pan with the bacon fat and brown on both sides for about 4 minutes per side, or until golden brown. Do not crowd the pan! You might have to work in batches, that's okay. Once the chicken is golden brown, transfer to a plate and reserve. If you have too much fat left in the pan, pour off most of it, leaving about 1/4 cup in the pan. Add the mushrooms and sauté for a couple of minutes or until they are soft and coated in fat. Season with salt and pepper. Add the Riesling wine, scraping up any browned bits on the bottom of the pan with a wooden spoon, and bring to a boil. Once the wine is boiling, return the chicken (skin side up), bacon, shallots and garlic to the pan. Partially cover, lower the heat to a simmer and cook for 45 minutes to 1 hour or until the chicken is very tender. Make sure to keep an eye on your pan, to see if the liquid is not evaporating too quickly and adding more as needed. Using tongs, transfer the chicken to a plate and reserve. Raise the heat to medium, add the heavy cream and cook until the sauce has thickened and is smooth and velvety, about 2 minutes. Place the chicken back in the casserole (or dutch oven) and sprinkle fresh chopped parsley. 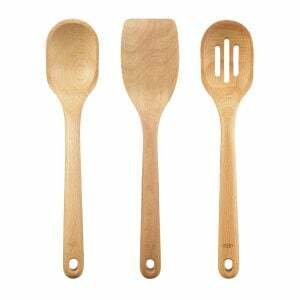 Serve immediately with rice, buttered noodles, potatoes and/or crusty bread. This dish is even better the next day, after refrigerated overnight for the flavors to develop. If you choose to do this, skip the parsley, wait for the Coq au Riesling to cool and leave it in the fridge until the next day. Then, remove any chilled fat from the surface with a spoon and reheat gently. Sprinkle with the fresh parsley just before serving. Enjoy! This post was sponsored on behalf of The Seeker Wines via One2One Network and it contains affiliate links. All opinions stated are my own. Chicken and bacon (or pancetta) = heaven! Can’t wait for whatever it is that you are sharing! Yum! I’m confused… the ingredient list calls for chicken breasts, but the instructions and descriptions seem to call for thighs… which one would be the recommended cut for this dish? It’s chicken thighs. Thanks for catching that! Basking in the glow of this meal. Made exact, just half portion. Thank you for the recipe, definitely in the running as one of the best meals ever made. This recipe looks wonderful! Thank you :) I would like to try it out with boneless, skinless chicken thighs. Do you have any recommendations on adjusting the recipe for this substitution? Would you brown the chicken at all to start? Would you adjust the cooking time? Would you increase the qty. of chicken? I know this would miss the flavor/moisture benefits of bone-in chicken, but I just don’t like eating around a bone! If you have any thoughts on that, I would love your advice. Thank you! Can I make this without the panacetta? If so, can I just leave it out or do I have to substitute it for something (and if that, is there something non-piggish?). Also is the cream necessary or would it taste also good without it?